Despite the mixed signals that Apple keeps sending on the subject, scripting is alive and well on the Mac, as users from all walks of life use it to automate all sorts of tasks. Scenario 1.61 (Mac App Store link) kicks things up a notch by allowing you to automatically execute a script when a given system event occurs. For example, you can trigger an AppleScript execution at login, logout, or even when a particular key combination is pressed. 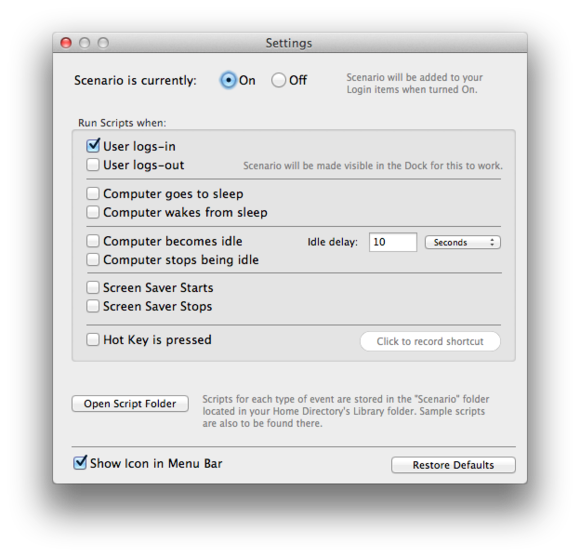 The app, which sits quietly in the Menu until called upon, is easy to configure and use, with a simple setting panel that lets you determine which scripts are executed in response to each of the available events. In a very nice touch, you can also enable and disable all actions by flipping a single radio button—and activating them also causes Scenario to re-launch automatically at login. Make better use of scripts with Scenario.